Have a look at what's on the menu at my kids' school in France. They get cheese every day!! I'll be adding more menus weekly as I receive them. There are so many things a French teacher can do with these in class. Just click here to watch a video in which I'll tell you about some of the ways I like to use these menus with my students. I have made five extremely versatile no prep printable worksheets available to use along with any and all of these French school lunch menus. Versions 1 - 4 have ten questions each while version 5 has six questions. The questions on these worksheets will have your students learning a lot about cultural differences concerning menu items as well as the amount of time French students get for lunch, why there's no menu for Wednesday, etc. Your students will find it interesting to see that French kids are offered une entrée, un plat principal, une garniture, un produit laitier, et un dessert every day. 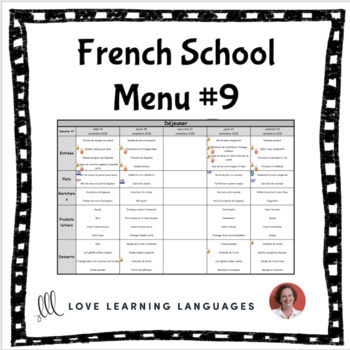 These menus and the accompanying worksheets are also available in my French Food & Drink bundle.